All our electric gates and fitting carry a comprehensive 2 year Warranty for peace of mind assurance. We are registered and Qualified "Beninca UK” installers for electric gates. We can carry out a basic electric gate installation from a single 5 bar gate with remote opening to a complete set up to include timed ground loop detectors wireless intercom or even GSM openers and intercoms. We can supply and fit Wireless intercoms, GSM “sim card” intercoms that are effectively a mobile phone which will dial a phone of your choice and give you full control of your electric gates from anywhere in the world. We also supply automation kits so you can install your own electric gates. All our electric gates have an option of combining a built in coded keypad and video. We fit all types of systems to include Above ground rams, below ground sub motors, sliding gates, and cantalever gates. We carry out any type of automation even on garage doors, we can also supply fit and automate swing opening garage doors with our own unique wing arm adaptors manufactured by ourselves. We absolutely refuse to be beaten on price. We also offer an annual service contract to help prolong the life of you system. Take a browse through our range of electric gates and feel free to give us a call to discuss your needs. Hampshire Gates provide a quality service for electric gates in Hampshire, Surrey, Berkshire, Wiltshire and Dorset, we can however travel any distance and offer a nationwide delivery and fitting service. We are an experienced family business with over 10 years experience in the electric gates automation industry. 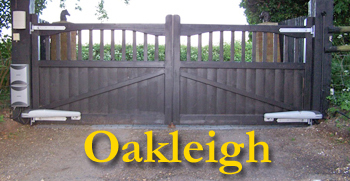 Hampshire Gates are experts within our field and pride ourselves on offering a professional, reliable, personal and friendly service to both domestic and commercial customers have a look at our customer testimonials and we have many more to show you if you require. We are based in Andover in Hampshire covering the areas of Salisbury, Winchester, Southampton and Bournemouth as well as travelling much futher nationwide. We aim to bring you bespoke individually designed electric gates of superior quality; each gate is designed to the highest specification with an unrivalled finish. We also offer the very best automation and entry systems.